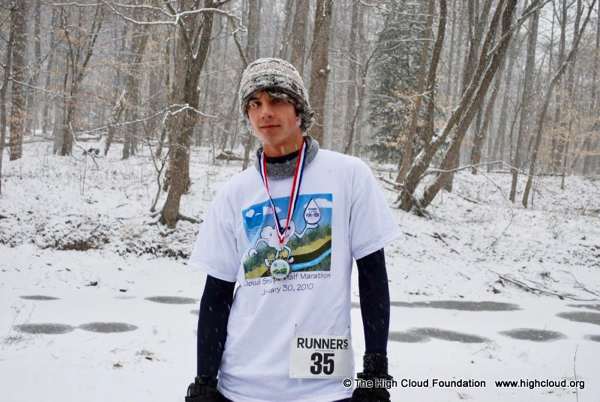 In honor of one of the few races I’ve run in the snow, I’m recapping the 2010 Cloud Snapple Half Marathon from eight years ago today. This particular race stands out because my Cruiser friends and I started out looking like normal people and finished with white Groucho Marx eyebrows. The race was run on the C&O Canal in Carderock, a quick drive across the Potomac River and into Maryland. 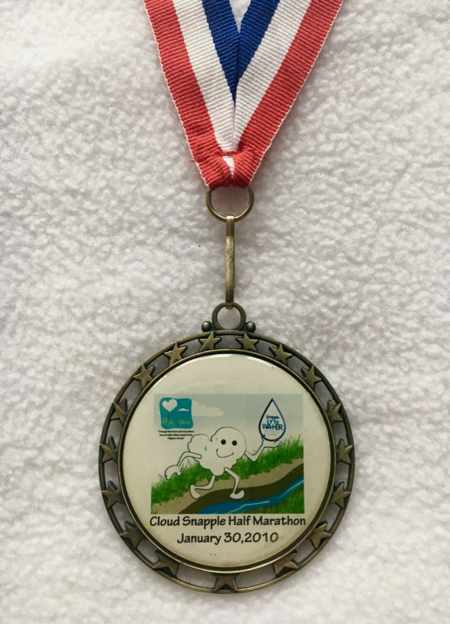 My friends and I were excited to run this race because it was an inaugural race and proceeds would go toward the High Cloud Foundation which supported children in desperate need from several different poverty-stricken countries. 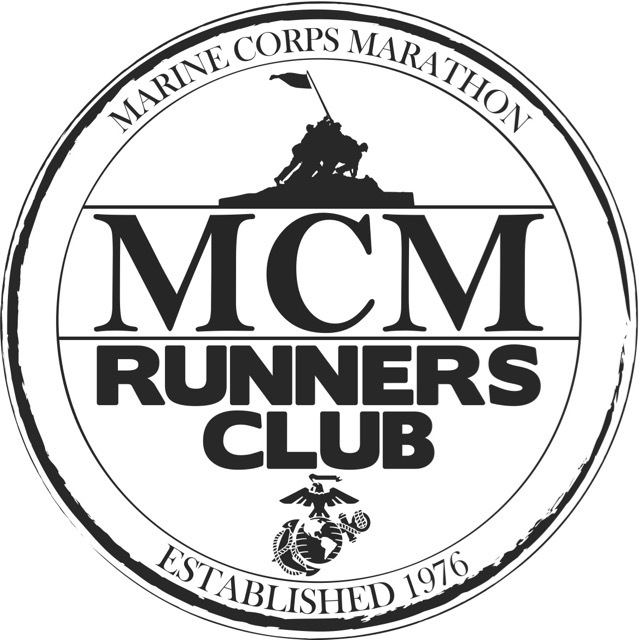 With an early registration fee of only $25 it was a very affordable race. The fee went up to $30, but capped at $40 the last two days prior to the race, still extremely cheap when compared to some of the other half marathons I’ve run. With a chance of snow in the forecast, Jerome drove Alan, Beth, and me over that morning in his SUV. We weren’t expecting the snow to start until after we finished the race, so we planned a post-race meet up for lunch with Miles and his running group in nearby Potomac. 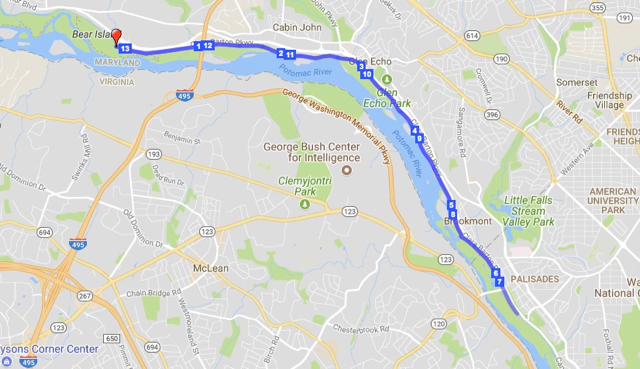 We had run on the C&O Canal many times before and knew that it was a relatively flat gravel and dirt trail with views of the Potomac River on one side and the C&O Canal on the other side (26 miles of the JFK 50-Miler run along the C&O Canal). The course was an out-and-back route which meant we’d be able to cheer on the lead runners heading back toward us after their turnaround – something I enjoy. Beth and I had decided that we weren’t going to race, but instead run it as a training run. I was about a month into my 2010 Boston Marathon training cycle and this would fit perfectly as a shorter mileage long run for me. 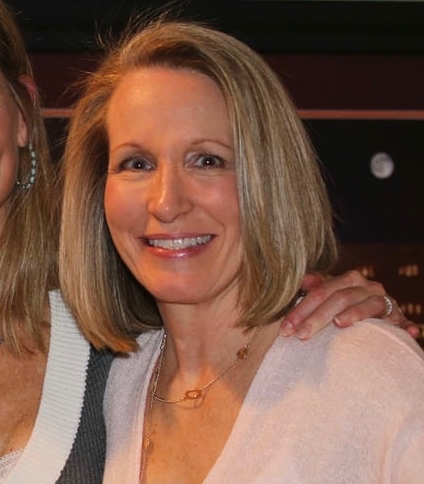 Anticipating a relatively easy race, Beth and I started out quite chatty and spirited. Within a half mile; however, we were already starting to have trouble with our traction as the entire trail became covered in a layer of slippery snow. We hadn’t even considered bringing our Yaktrax (affiliate link) because of the later snow start in the forecast. Neither of us were wearing a brimmed hat or visor and the constant pelting of snow in our eyes forced us to look toward the ground. A combination of slipping with every step we took and the icy buildup on our eyelashes forced us to look downward at the snow-covered trail for the remainder of the race, making for a rather boring run. A few miles into the race, though, we noticed that the trail was becoming less slippery as the snow became deeper. The thick carpet of snow felt good on the joints, but it covered the unevenness of the trail creating dangerous drop-offs perfect for twisting ankles. As the snow came down harder, we were forced to keep our eyes glued to the trail to prevent being blinded – if only I’d worn my ski goggles. Unfortunately, there was very little cheering on for the lead runners making their way back to the starting line as we kept our eyes glued to the ground and focused on not slipping into their paths. Beth and I were thrilled to finally make it to the turnaround point just after hearing our names called out by Jerome who had turned shortly before us and was making his way back toward the finish. The volunteers at the turnaround were so encouraging even though they had to be freezing! We finished with a time of 2:12:18 (10:05 pace) which for me was 5th out of 9 in my age group which consisted of a 10-year age range (I was on the young end of my age group). As I mentioned, my camera battery died after just one snap and I didn’t get any pictures of us from after the race, but the following picture pretty much sums up how we looked. And since none of the Cruisers still have our race shirts, here’s a picture of this finisher modeling his shirt. Our friend Joe and his daughter Sienna arrived at the race just in time to cheer the lead runners and subsequently the Cruisers in from our rather adventurous race. By this time all area roads were a mess, but Joe and Sienna were troopers and made the trip anyway. 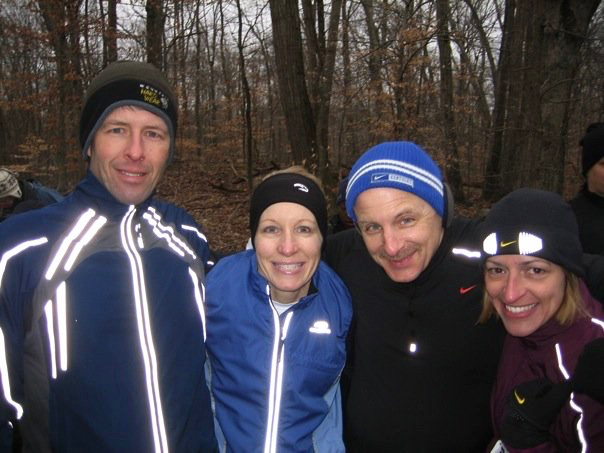 After the four of us had finished the race, we skipped the post-race frozen pizza and loaded back into Jerome’s SUV, and along with Joe and Sienna, met Miles and his friends at a little cafe in Potomac for lunch. After an hour or so of marveling at what a crazy race we’d just run, we decided it would be a good idea to get back on the road and head home before the roads got even worse. Jerome’s SUV slipped and slid all the way home, but eventually got us home safely. 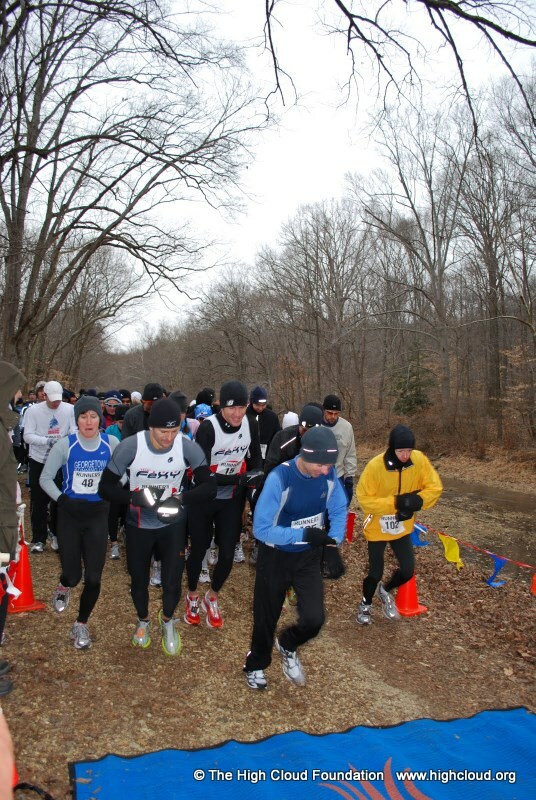 For a first year race where the weather forecasters missed on the timing of the impending snow storm, the race coordinators and volunteers did a fantastic job making it an enjoyable event. Every single non-runner who was out there either volunteering or cheering for their friends, deserved a round of applause. From light flurries to heavy snow, Mother Nature couldn’t dampen the spirit of these runners or their fans! 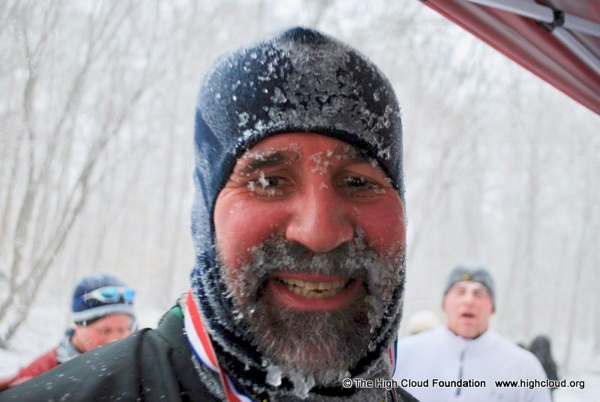 Alan returned to run the Cloud Snapple Half Marathon in 2011 after yet another big snowfall, and recalls that the snow had had a chance to thaw and refreeze making it extremely icy. He says he slipped and twisted his ankle about fifty times! Have you run on the C&O Canal Towpath? 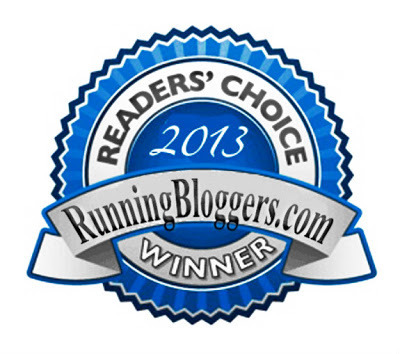 Have you gotten caught in a snowstorm on a run or in a race? Do you prefer out-and-back, loop, or point-to-point race courses?